4PCE BRUSH SET CONTAINS 1 EACH OF 0.5", 1", 1.5" AND 2" BRUSH, WITH SOFT-GRIP HANDLE. ..
0.5"/ 12mm FFJ ALL PURPOSE PAINT BRUSHAll purpose brush offering a balance between price and quality..
1" /25mm FFJ ALL PURPOSE PAINT BRUSHAll purpose brush offering a balance between price and quality. 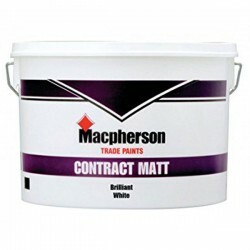 ..
2"/50mm FFJ ALL PURPOSE PAINT BRUSHAll purpose brush offering a balance between price and quality. M..
3"/ 75mm FFJ ALL PURPOSE PAINT BRUSHAll purpose brush offering a balance between price and quality. ..
4" / 100mm FFJ ALL PURPOSE PAINT BRUSHAll purpose brush offering a balance between price and quality..
18' x 12' BLUE TARPAULINHeavy duty multi-purpose tarpaulin, manufactured from double laminated pol..
BRUSH CLEANER 500ML EVBSolvent based. 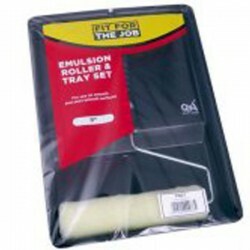 Suitable for use on brushes, rollers and pads. Cleans gloss, e..
12' x 9' COTTON TWILL DUST SHEETProfessional cotton twill dust sheet. Ideal for protecting furniture..
PK(5) FFJ DUST MASKS - CUP TYPEDisposable non-toxic dust and filter mask, low risk cup type for non-..
2" MASKING TAPE - 50mm x 50m ROLLA general purpose masking tape giving excellent results. For markin..
1" MASKING TAPE - 25mm x 50m ROLLA general purpose masking tape giving excellent results. For markin..
FFJ MASONRY/EXTERIOR BLOCK BRUSHA high capacity block brush, with a soft grip handle for added comfo..
METHYLATED SPIRIT 250MLRustin's Methylated Spirit suitable for thinning, spirit burning heaters, lig..
FFJ MINI ROLLER KIT: EMULSION & GLOSSMini roller kit with tray, foam refill, long pile refill an..
Mini Roller Refills Emulsion pack 10Ideal for use on all smooth and semi-smooth surfaces; suitable f..
Mini Roller Refills Gloss pack 10Ideal for use with all gloss paints. Suitable for use on all smooth..
TUB 100 MULTI-PURPOSE WIPESRemoves paint, oil, grease, adhesives, silicones, mastic and more from ha..
FFJ 2" PAINT SCRAPERDIY scraper with polished steel blade. Soft grip handle for added comfort in u..
FFJ 4" PAINT SCRAPERDIY scraper with polished steel blade. Soft grip handle for added comfort in u..
Polythene Dust Sheet 12' x 9'Disposable low-density polythene dust sheet (LDPE), thin clear polythen.. BOX 100 POWDERED DISPOSABLE GLOVES Sz L..